Your Milford driveway or Milford parking lot is usually the first part of your property a visitor or potential customer sees. Make a good impression with a smooth asphalt surface that is damage free. Tom McDonald Contracting has been in the paving business for 29 years in Milford, Delaware. Call the experts at (302) 219-7939 for your Milford residential or Milford commercial resurfacing job. Does your asphalt look neglected? 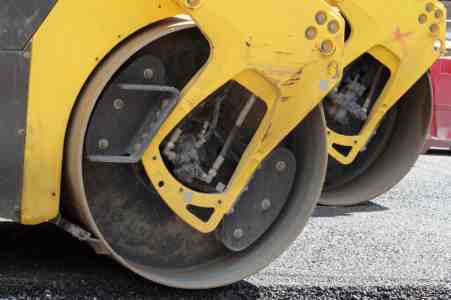 If you've got cracks, bumps, or potholes in your asphalt, that's the impression you're giving potential clients. Your parking lot should reflect your company's commitment to service with a smooth, damage-free surface with clearly marked parking spaces and road signage. Get rid of the bumps in your road with a professional asphalt resurface. Our crew will make your driveway or parking lot look brand new. Call (302) 219-7939 to schedule your Milford asphalt resurfacing project. An asphalt driveway or parking lot doesn't last forever. Don't put your company at risk for parking lot-related injuries. Make sure your asphalt looks great and is damage free. Tom McDonald Contracting commercial asphalt resurfacing can also provide striping, asphalt berm, and granite curb installation. We've been in the paving business for 29 years, resurfacing Milford residential and Milford commercial asphalt. Restore your asphalt and your peace of mind. If your kids like to play basketball, roller blade, or ride bikes on your driveway, you want to make sure they are safe. Protect your family with professional Milford asphalt resurfacing. A smooth driveway is a safe driveway. Call (302) 219-7939 to restore your residential or commercial asphalt surface. We've been resurfacing Milford surfaces since 1990.